Digestive Healthcare needed help boosting their online presence and reaching more of their local, targeted prospects. Our customized digital strategy drove in 100+ new leads per month. Here’s how we made that happen. 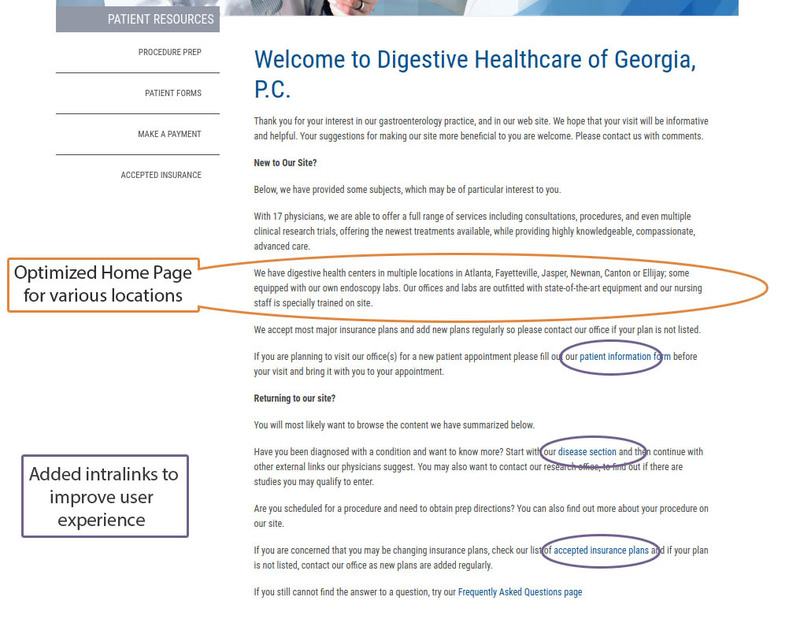 From performing research studies and clinical trials to providing patients with cutting-edge treatments, Digestive Healthcare of Georgia has become a leader in the field of gastroenterology, with locations throughout the state. But being a multi-local medical facility comes with challenges, including determining how best to target local prospects at each of these locations. With multi-local as our specialty, we were excited to help Digestive Healthcare increase their brand awareness at the organizational level, as well as with each of their locations. At the start of our partnership, we built a comprehensive keyword list, which served as the foundation of our future work. Every tweak of their website, every backend optimization – all remained focused on the end goal: to get Digestive Healthcare to improve their rankings and brand reach for the terms their prospects use the most during their searches. Of course, the work we do to optimize clients’ websites isn’t confined to backend changes suited only for search engines. The performance of a website relies heavily on its ability to engage and convert actual users, which is why we committed a considerable amount of time improving Digestive Healthcare’s patient appointment portals. Our improvements made these pages more enticing to the users, resulting in increased conversions. With that said, a high ranking on Google is dependent on the search engine’s ability to find, and crawl, a site. 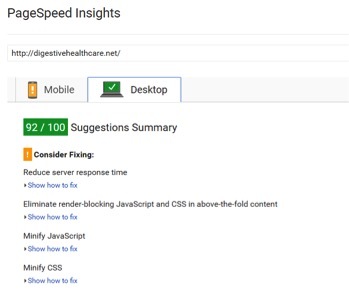 While our content and design teams enhanced the overall user experience of Digestive Healthcare’s website, our technical SEOs got to work cleaning up the backend which yielded impressive ranking increases across the board. From image optimization to minifying CSS and reducing server-response time, we successfully improved our client’s PageSpeed Insights to an impressive 92 (out of 100). This type of page speed reduces user frustration and wait-time, which is why Google rewards fast websites with better rankings. 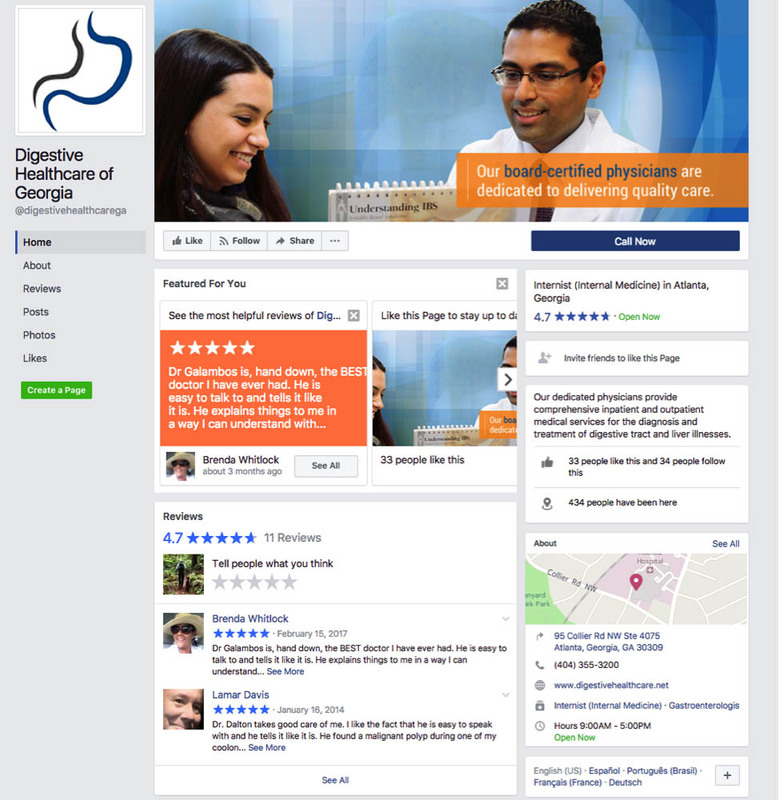 Digestive Healthcare’s social media channels also needed some improvements. An incredible number of prospects turn to platforms like Facebook to not only assess the value of a medical facility but to read reviews. We redesigned their Facebook page to make it a conversion-focused channel where users are eager and willing to share their stories. From their Call Now CTA button to the newly added cover photo, their Facebook page has now become an incredible source of highly qualified leads. The changes, optimizations, and strategies we implemented would mean very little if they didn’t deliver results. Everything we have done so far hasn’t just improved rankings and traffic – it has dramatically increased their lead volume by 334%. The impressive part of all this is we’re just getting started. The strategies we’ve put into place are designed to continually improve Digestive Healthcare’s rankings over the long term. 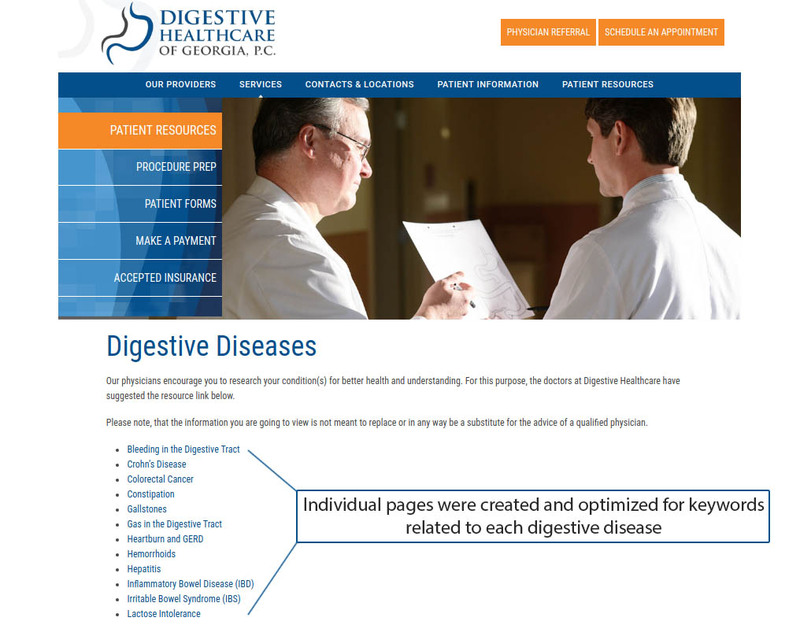 And, as we monitor our analytics, we’ll adapt our strategies accordingly to ensure that Digestive Healthcare’s name is top-of-mind, and top-of-search-engines, for everything related to the practice of gastroenterology in and around the Greater Atlanta area.